This section features the information which may be useful for carving netsuke (and other art forms). 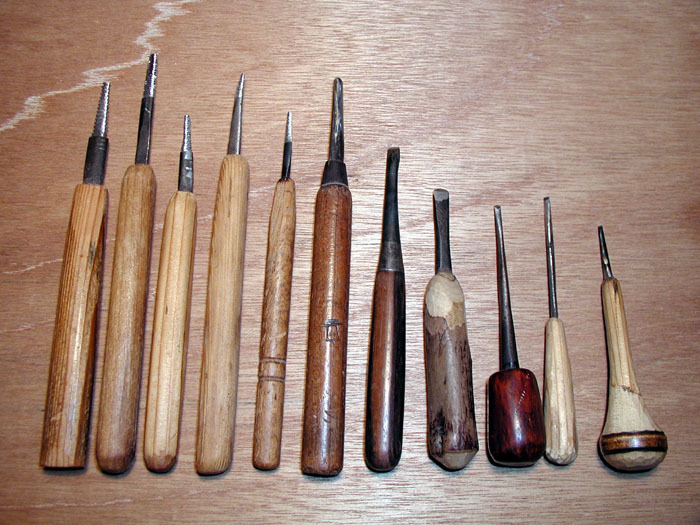 This section mainly deals with the carving tools (and their use) of a contemporary netsuke artist Komada Ryushi, who has more than sixty years of career as a carver. You can get a larger image of each photo by clicking it. Ryushi was born in 1934 in Tokyo. He started studying okimono (statuette) carving, particularly of female figures dressed in kimono, under his father Ryusui in 1969 when he was fifteen years old. He became independent in 1962, and two years later, he began studying and carving netsuke. His first one-man show was held in Los Angeles in 1981, the second in Tokyo in 1992. He served as president of the International Netsuke Carvers' Association for ten years since 1994. He is good at carving female figures, but he also covers a wide range of subject matters such as male figures, children, and animals. For his netsuke titled "Afternoon", Ryushi was awarded "Monbu-daijin shorei-sho" [lit. The Incentive Prize by the Minister of Education, Science and Culture] at the 22nd Japanese Ivory Sculpture Exhibition in 1999. In this carving, the woman is ringing a small bell in her hand and plays with the cat at her feet in the afternoon. He was also given "Golden Dragon Award" by Kinsey International Art Foundation in April 2009 and "Bronze Hakutaku Award" by International Netsuke Society in July 2009, for his accomplishments as netsuke artist over the years and his efforts in continuing the art of netsuke carving onto the next generation. In March 2017, for the opening of a netsuke exhibition in Washington DC, he gave a talk and carving demonstration with his daughter Makiko at Japan Information & Culture Center of the Japanese Embassy and also at Smithsonian's Freer Gallery. He was live-filmed by the Facebook of NPR (National Public Radio). NPR Facebook live-filming. About 30 minutes (with audio). 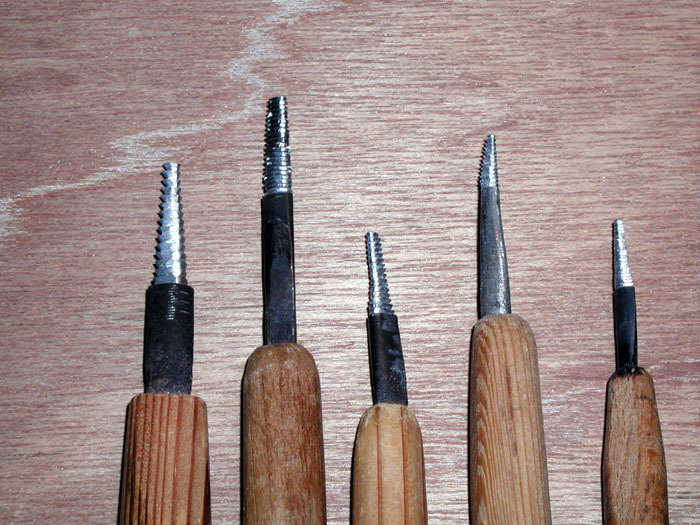 In this video, Ryushi demonstrates how he uses some tools including hidari-ba (left-blade) carving knives. NPR's article with short video (about 2 minutes with music) and photos. This article includes photos of Ryushi's carving tools and several of antique netsuke displayed at the netsuke exhibition held by the Embassy of Japan. 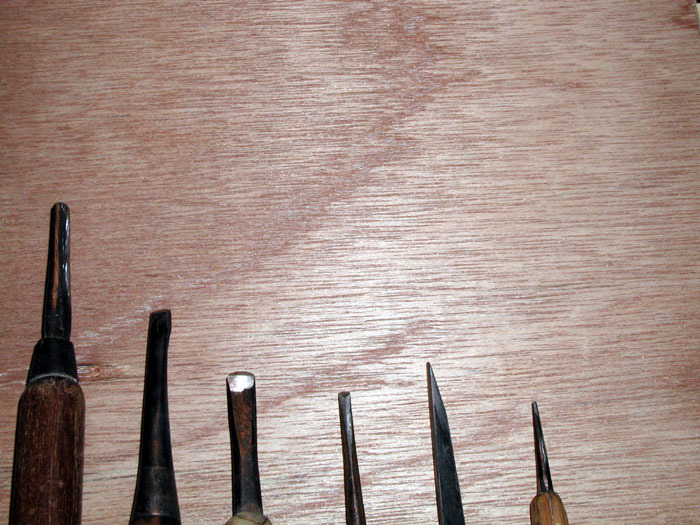 Netsuke carving involves many different processes and tools. 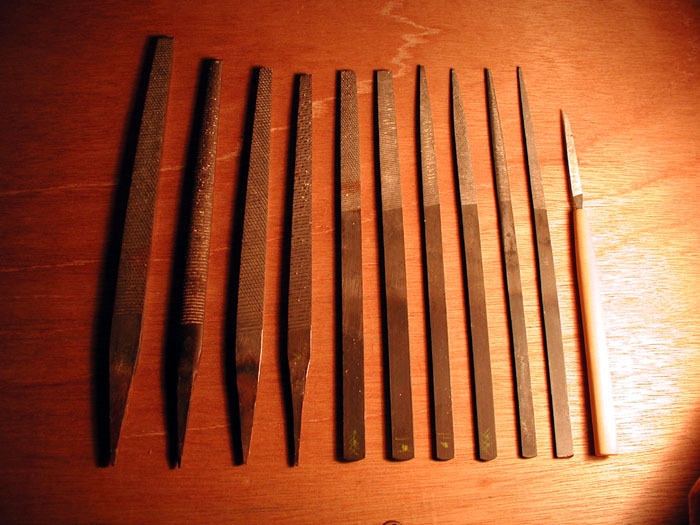 I will give details later, but for the moment, let me show you a selection of the tools that Ryushi usually uses. The five files on the left are called Gangi-yasuri (or Gangiri or Hamaguri). 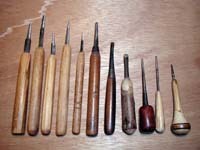 On the right are six chisels. 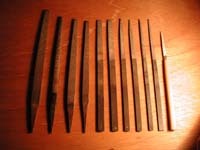 The images below are close-up photos of the tips of files and chisels. 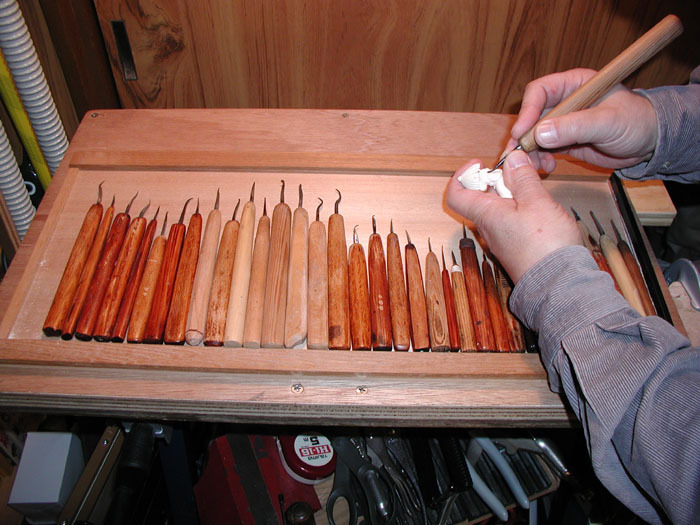 Some of the custom-made files that were hand-made by a special file maker. He says that there is no comparison between those and mass-produced files. 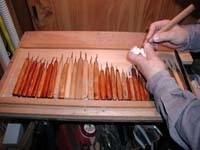 A variety of hidari-ba (left-blade) carving knifes, and he demonstrates how to use one. Most of these knives are made by himself. 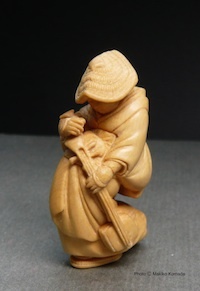 This netsuke, when it was still in progress, appears in the aforementioned NPR videos and article. This photo shows the piece in completion. 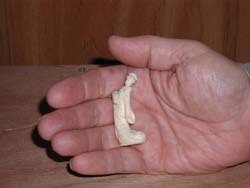 Click here for [Netsuke Class Report] that was made in July 2000. For enquiry, please contact the Culture Center below. September 2000: The students are now learning how to make blades for scrapers out of a stick of steel. November 2000: Two persons newly enrolled in the course! December 2000: All the students are making a strenuous effort to finish their own netsuke. October 2002: Compared to the beginning of the class, more than double the number of students are enrolled at the moment. January 2007: In the last few years the classes have about 20 to 30 students, each of whom have been creating netsuke with their utmost originality. June 2017: The two classes have produced some professional artists over the 17 years since those commenced. The classes became so popular that sometimes there is a waiting list for enrollment. Community Club Tamagawa in Tamagawa Takashimaya Department Store has a course in contemporary netsuke carving since October 18, 2003. Under the instruction of Komada Ryushi, students are learning how to use tools and create netsuke of their own! Sankei Gakuen, the very first culture center established in Japan, their Shin-Yurigaoka school in Kawasaki City, Kanagawa prefecture, commenced a new class of netsuke carving once a month starting on April 28, 2017. Wood and Do-It-Yourself Shop Mokumoku Co., Ltd.
Retail shop specializing in wood materials. Click here for a report written around 2000.